It’s been more than 2 years since my post (read below) and though a lot has changed in this city, I’m happy to report that my favorite soba spots remain the same. If anything, they’ve evolved into an even better place by adding more menu options and Happy Hour! I go for lunch about once or twice a month and it never disappoints. Lunch isn’t exactly cheap, but totally worth it as a treat every now and then. If the average $20+ seems too extravagant for lunch but you are a soba lover like me, do not pout, you can get plain soba starting at $10. 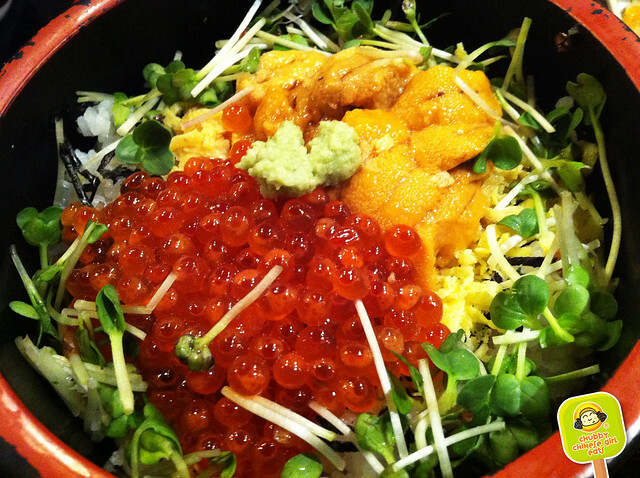 A generous amount of sweet creamy sea urchin and pops of salty salmon roe sit on top of warm rice. 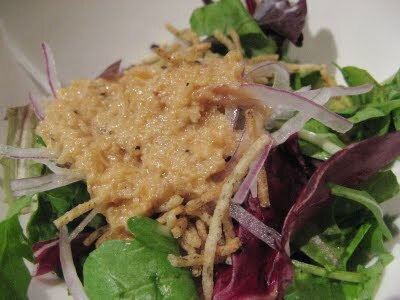 Egg strips, seaweed and micro-greens. 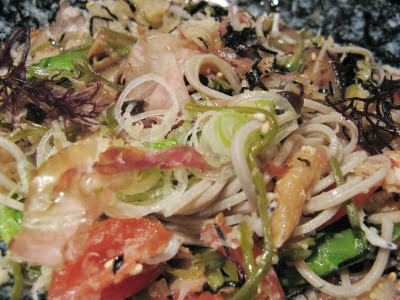 The soba has that unique texture, toothsome and firm with an almost nutty aroma from the buckwheat. Strips of shiso leaf aka Japanese mint brightens it. A dip in the tsuyu (scallion and fresh wasabi in a dashi, sweet soy and mirin sauce) and I’m once again reminded of the simple joys in life. It’s a chinese tradition to have noodle on your birthday, usually a specially long “mein” (noodle) dish, symbolizing long life. Back in Shanghai, I grew up having this soy sauce soup noodle, the broth had pork lard for flava’, topped with scallions and a pork chop. 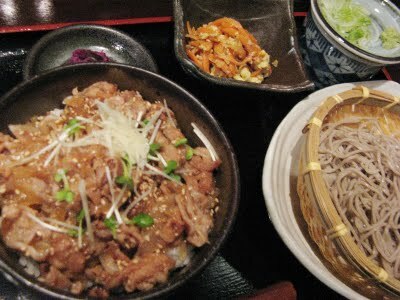 Unfortunately, unlike the old days, some of these old school dishes are lost (use of pure pork lard can rarely be found). But my parents are keeping it partially alive, they had a bowl on my behalf this year. We don’t have anything alike around us, therefore my work buddies took me to Soba Totto for soba instead. This has been the 2nd year we’ve celebrated there, the quality of their food brings us back, not just for birthdays. Aside from Soba Nippon, this is my next favorite go to place to get my soba noodle fix. Everything is done so delicately, I always know I’ll walk out completely satisfied. 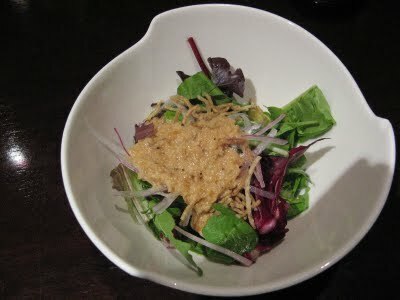 Soba Totto’s salad might be one of my favorite salads in midtown. This comes with your lunch order. If all salads were this good, I might be able to stick to a salad “diet”. 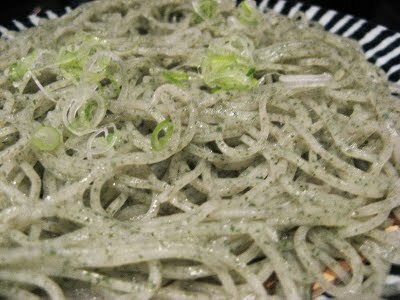 I love the tangy onion dressing, the finely strips of onion – sweet yet not overpowering and the topping of fried seaweed soba pieces – extra crispy, adding a really nice texture. Not a lot of ingredients, but definitely not simple. 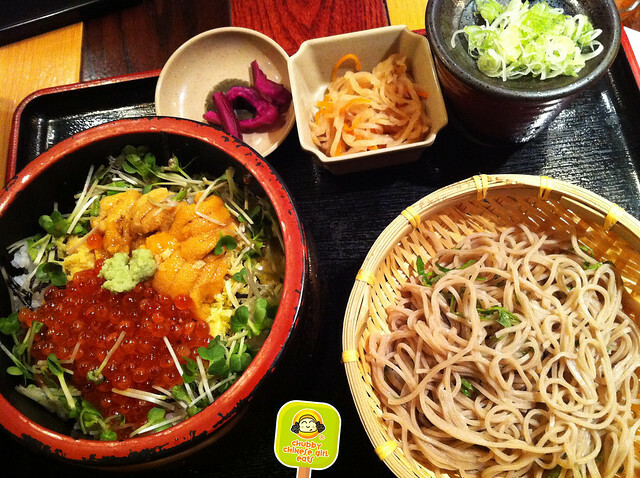 Another amazing choice is the Gokuraku Soba, cold soba with 13 kinds of vegetables. I need ma’ meat to be satisfied, but surprisingly I enjoyed this regardless. The Jako Baby Sardines (Tiny white little fish with black eyes. 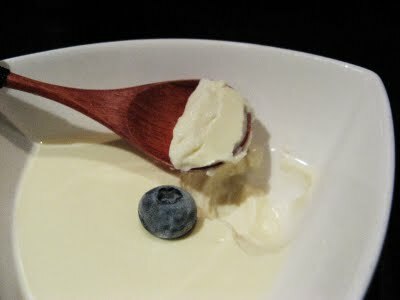 Not scary, very tasty) added a tiny bit of protein. There’s also mushrooms, a couple types of seaweed, grated radish, cherry tomatoes, tofu, beans, cucumber, asparagus, and topped with bonito flakes and sesame seeds. The soba has a bouncy stretch-chew which is really nice and there’s so many different textures and flavors, there’s really no two bites alike. Plus the soy dipping broth is on the side, so you can control the amount, I poured it all in though, and it wasn’t overly salty. This is one of those times that as I’m writing, I want a bowl. They also have a seaweed soba, but I think this was only special of that day. 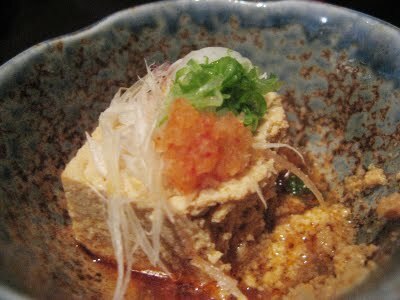 We also tried Monkfish Liver. Around the table we couldn’t figure out what this was, we thought it was eggs with tofu and some kind of fish roe. Odd texture, that kept you wanting a little more. 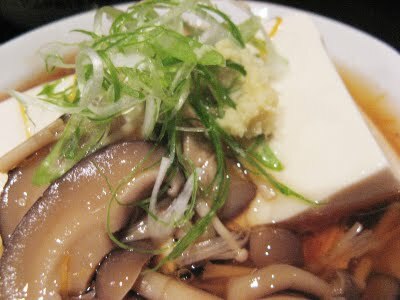 As a side dish, they had mushrooms with a silky tofu, very light and pure. My friend had the Ginger Pork set. The ginger was overpowering to me, but the flavors of the stir fried pork was good, thought I still prefer the miso pork at Dainobu, at a fraction of its cost. 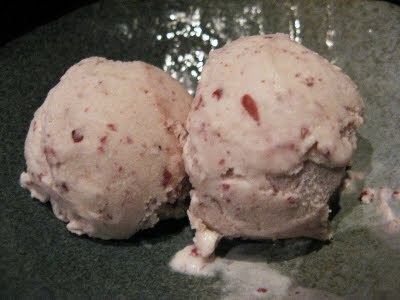 For dessert, their homemade Red Bean ice cream gives Chinatown Ice Cream Factory’sversion a run for it’s money. This one is smooth, loaded with red beans, really creamy and not too sweet. Their Annin Tofu is to die for. Annin Tofu means Almond Tofu in Chinese, you can get that during Dim Sum. This one, had no almond flavor, so the name surprises me, but technicalities aside, this creamy, melt in your mouth tofu is like a dream. The amaretto is a surprising addition and each spoonful makes you wish this sweet moment would never end. Lunch is great, prices are reasonable for midtown, thought it wasn’t always the case. When they first opened food was superb, but not so much the prices, so I’m glad they’ve adjusted their menus and $ since. Though there are tons of outstanding Japanese places in the neighborhood, Soba Totto stands firm. For dinner, the menu expands to Yakitori. There’s a nice bar/lounge room in the front, good for an after work cocktail hour. I wish soba-specializing restaurants were more common. My neighborhood has tons and tons of pho and ramen, but no soba! Happy Birthday. Have a really, really great one. I like the noodle idea, but WHERE'S THE CAKE? I like that idea too. yeah i did, better than nothing right? 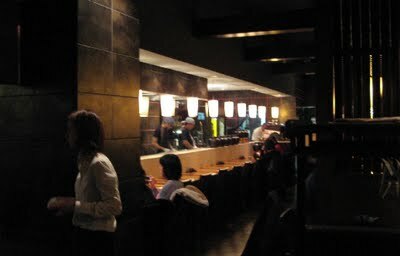 Yeah, I actually only know of this one and Soba Nippon in nyc, they have soba "chefs"
aww, happy birthday!! spoil yourself, you deserve it! Happy Birthday!! I guess our birthdays are pretty close to each other. 🙂 That seaweed soba looks really yummy. Man, the food in NYC always looks so good!!!! This is one of the places that makes me glad my boyfriend lives in East Midtown. The corn fritter appetizer is something I daydream about, and I could seriously eat their chicken meatballs every day for the rest of my life. 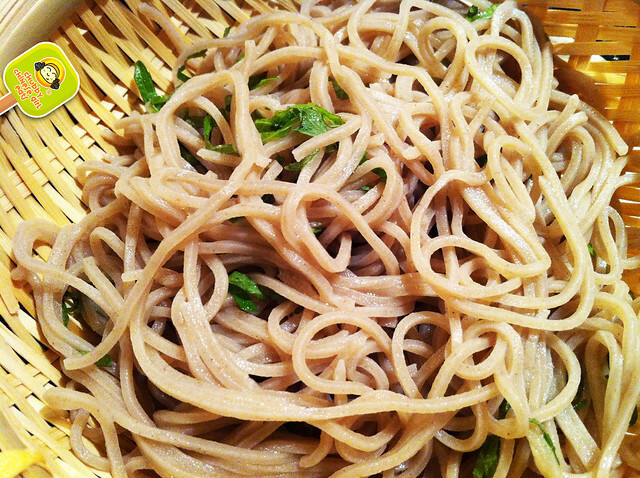 My boyfriend loves the 13-vegetable soba, but we've never tried most of the dishes you had. Guess we need to branch out on our next trip. Happy Birthday! Looks like a great way to celebrate!! !